One plate of specified weight. Select a size: 2.5, 5, 10, 25, 35, 45, 100 lb. These are among the most popular plates we sell. Our customers have been extremely happy with these. They are some of the highest-quality cast iron plates you can get anywhere. 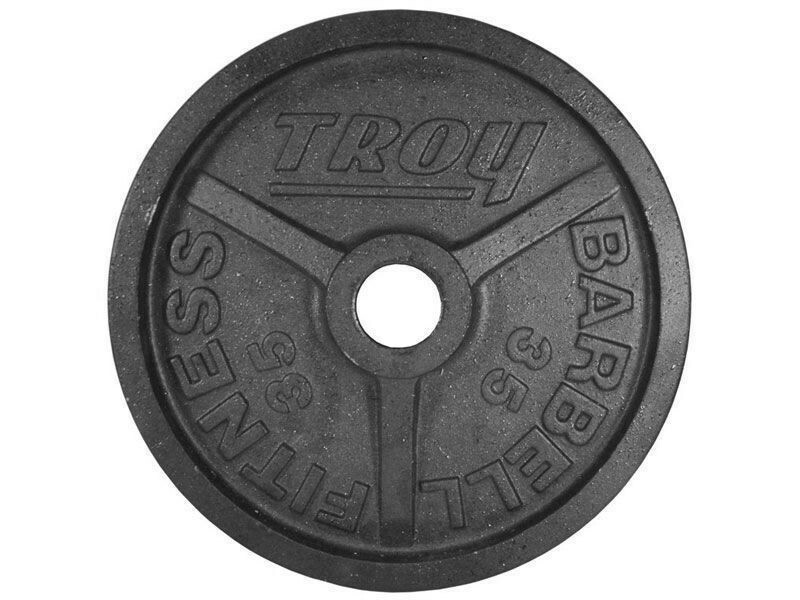 Nothing fancy like rubber or urethane coating, just plain iron plates that look great, make noise, and are super rugged to last decades. Many weights have no weight accuracy guarantee, leaving you sometimes unbalanced with 10 extra pounds on one side of the bar. Yikes! 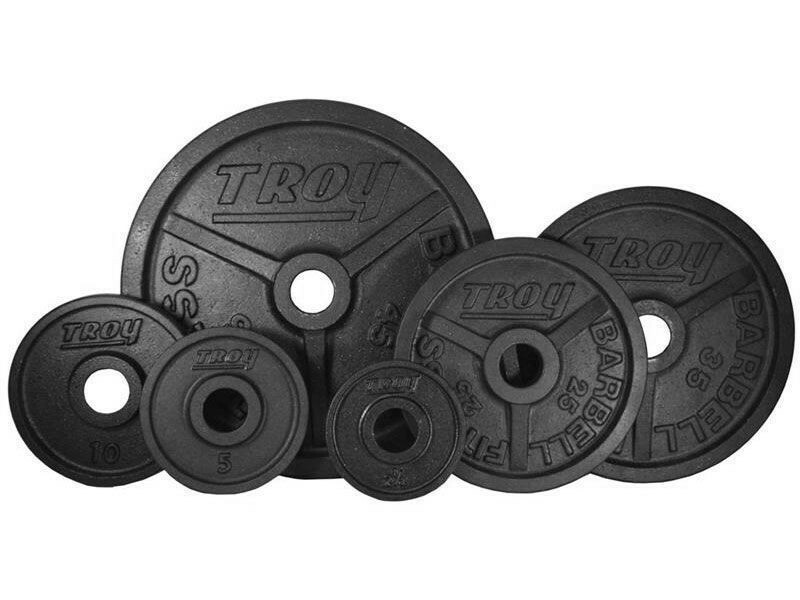 With these, we guarantee that each plate is within plus or minus 2% of the indicated weight. So a 10lb plate is within 3oz, and a 45lb plate is within 14oz. In reality your plates are going to be closer than that, because we certainly wouldn't want to be faced with frequen rejects. If you receive a plate that is out of spec, we will replace it and take care of all shipping charges. Cast iron plates tend to have rough spots. 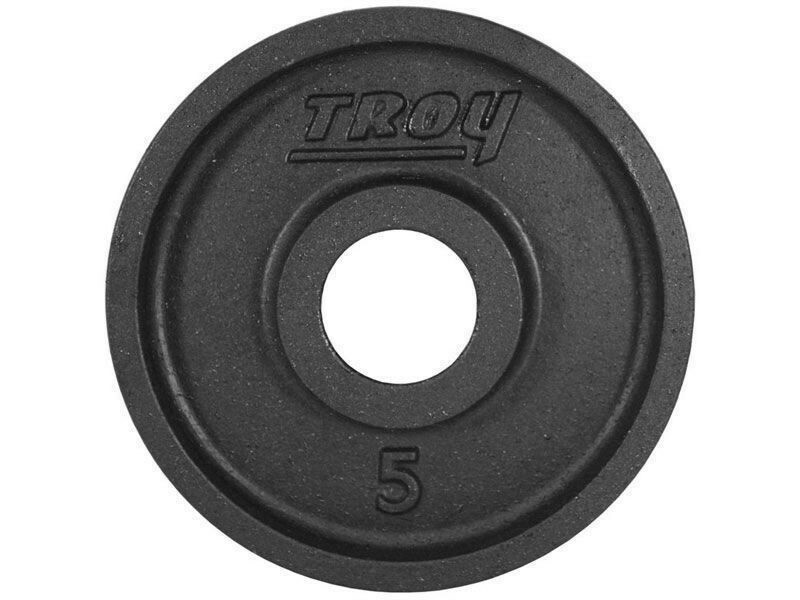 Not Troy plates. First, the plates are cast using molds, like any other plates. But casting isn't perfect. So next the plates are machine milled down to a consistent size and weight, resulting in smooth surfaces all over, removing all those casting imperfections that will scrape your hands. 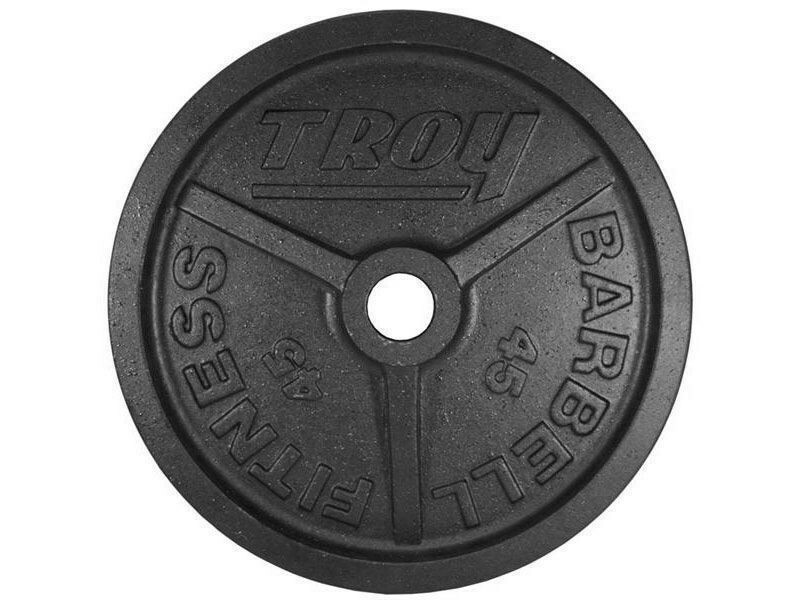 The 45lb and 100lb plates are milled down to the IWF/IPF regulation diameter of 450mm. This size sets the bar at the perfect height off the floor for deadlifts and cleans. The standard diameter also makes them compatible with many other plates out there, so you can mix and match with confidence that all plates will share the load on the floor. The wide flange, or rim, around the plates helps you handle them without the risk of dropping them and causing injury or damage. Some customers like this style better than those with "grip holes" because these have more of a traditional look and can also be gripped easily anywhere around the circumference. 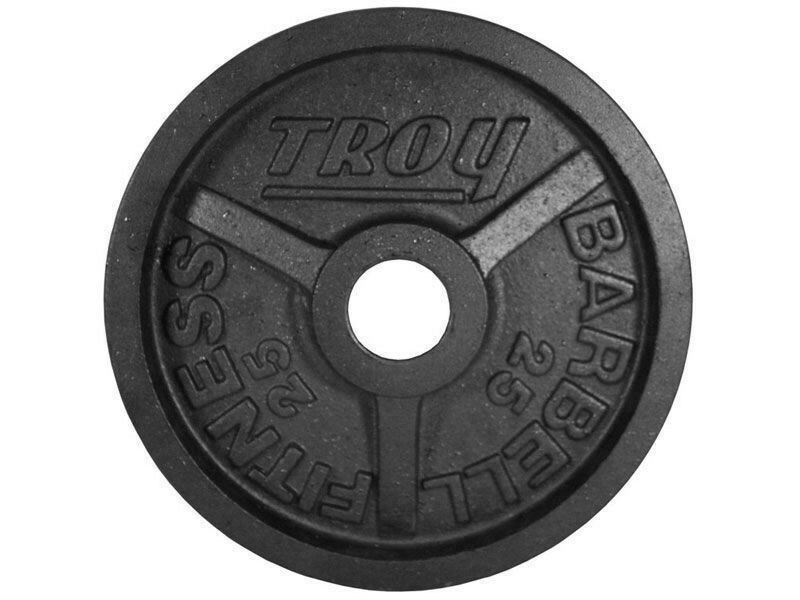 We are an authorized dealer for Troy Barbell products. This means that if you uncover a problem later on, all you need is your receipt. Contact us and we'll take care of it under Troy's warranty. These were redesigned slightly in 2019. The outer rims on the new version have more of a rounded edge to make ite easier to grab the plates when they're stacked up on the bar. 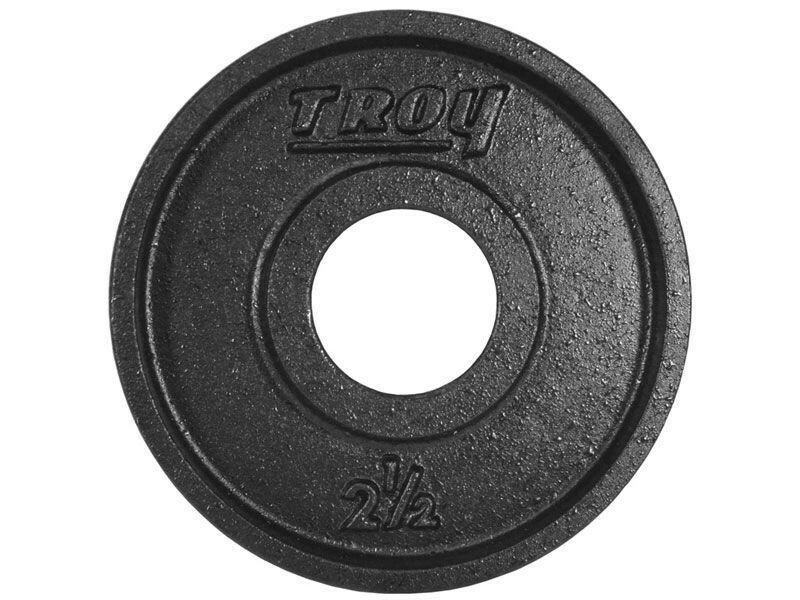 Here's Alan Thrall of Untamed Strength doing a 600lb deadlift with these Troy plates. See our article comparing these with the other Troy plates.